For an elegant addition to your next event, print your logo or message on these black personalized napkins. Perfect for formal events, fundraisers, cocktail parties, weddings and more. Featuring high quality 2-ply tissue. Needed black cocktail napkins with one color printing on the fly! Corporate branding is black and matte white. We are hosting a cocktail event for media and key accounts. First impressions are everything. Black Napkin. Custom Art option. Foil stamp color legibility. Great Customer service representative per-order conversation. Option faster than 5-10 days? BEST ANSWER: Rush services are available. They are dependant on current production levels and your need. It's best to contact our Customer Service Department with your info so they can work up a custom quote, including shipping to your location. We placed an order last year which was sent to Production on April 19 (Thursday), and it shipped on the following Tuesday April 24. Considering it included a weekend, we got it earlier than 10 days. More like 3 days shipping once it went to production. Hope this helps. BEST ANSWER: A ply is a thickness or layer of a folded material. What is a 2-ply napkin? BEST ANSWER: The perfect combination of value and quality, our 2-ply napkins feature two layers of soft, absorbent material. BEST ANSWER: A coined edge is an embossed pattern of lines around the outside edges of a napkin. 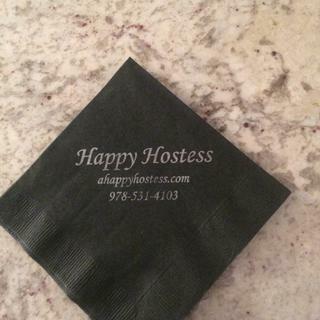 Why can't I print a full color logo on a colored napkin? BEST ANSWER: Full color printing is not available on colored napkins because depending on your artwork and the napkin color, the ink may not show up on a colored background. The black beverage napkins & white hand towels were classy & beautiful. Made a great impression to our wedding! 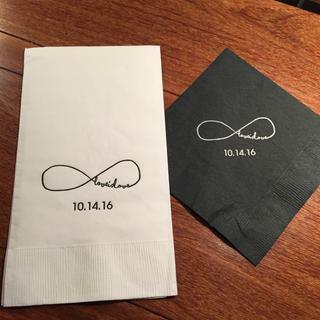 The black beverage napkins & white hand towels we ordered were classy & beautifully printed! Hi Maria, thank you for your feedback. The color option you selected, silver metallic flat, is a flat ink color, and therefore isn't quite as bold as our foil color options. Our silver metallic foil is a much bolder ink choice, in case this helps in your decision making process next time. I'll be sure to pass this feedback along to your account manager and to our manufactures. Thanks again for your order, and we hope to work with you again soon!